Ever thought you were the perfect candidate, sent in a perfect job application, and still heard nothing or got rejected? Find out why inside. First of all, is there such thing as a “perfect” resume? Not exactly. Think of it like trying to make a “perfect” sandwich for a customer. You’ve got to get all the technical sandwich details correct, like including bread, meats, cheeses, vegetables, condiments, etc. If you forget any of these basic requirements, then you’ll create a super weak sandwich. And that’s the easy part. What’s the the biggest problem? — Having all the ingredients your customers want. But, even if you do have all of the required ingredients, every customer will have their own subjective taste. You send out your “perfect” resume and cover letter. Then something weird happens: No response. Weak interest. Outright rejection. OK, what about the “perfect” resume? Well, let’s assume your resume has all the basic requirements (perfectly formatted, no spelling errors, targeted at the business, has the relevant sections, contains excellent bullet points, etc.) Furthermore, you’ve got all the necessary qualifications and education to do the job well. No response. Weak interest. Outright rejection. To find out what happened, I asked hiring managers, HR professionals, recruiters, and staffing experts to help me create the complete list of reasons why a “perfect” resume would be rejected. Their responses were both enlightening and disheartening for the out-of-luck job seeker. You can actively work to mitigate these problems. Here’s why your “perfect” resume was rejected, and what you can do to solve these problems. Discriminatory: Racism, misogyny, and other forms of prejudice are still problems in the 21st century workplace. If you encounter a hiring manager who does not like your race or gender, it will be difficult break through that barrier. To get past a discriminatory hiring manager, you may need to find an ally in the company to help pressure him/her into giving you an interview. Easier said than done. Winning over a picky hiring manager could be as easy as simply having a phone or email conversation with them directly. People with quirky prejudices tend to soften up once they get to know the actual person better. Some positions receive a huge amount of application spam, leaving some novice hiring managers reeling and disorganized. Your perfect resume simply be getting lost in the shuffle. You need to persistently follow up. Email or call the hiring manager and ask if they received your application 2-3 days after you send it in. Be prepared to answer questions on the spot about your application if you do manage to get connected to the hiring manager. Practice up on your interview skills beforehand. You’re missing a certain “X” factor. This “X” factor can be almost anything. In the case of Larry Stybel, a professional recruiter, he recounts how he was asked to recruit a female VP for a company where all of the vice presidents were male. Although this is technically illegal, all he had to do was ignore resumes from men – even the “perfect” ones. If you’re missing that “X” factor the company wants, your resume will be looked over, no matter how good it is. “Authenticity” Discrimination: An business such as a Chinese restaurant may want to appear more “authentic” by hiring waiters that look Chinese over experienced waiters of another race. Positive Discrimination: “When two perfect candidates apply for the same position, preference can be given to a candidate who belongs to a minority group,” explains Chris Delaney from Employment King. It’s impossible to know you’re missing an “X” factor, but if you suspect that’s the problem, you have to sell yourself hard to the people in charge. You’ll have to convince them that they can get their “X” factor in another candidate, and that you’re too strong to pass up. Be ready to uproot and move on the fly. In some cases, your perfect resume might be rejected because you’ll need to relocate for the role. If the company needs that spot filled immediately, your resume may be ignored, explains Stephanie McDonald from Hire Performance Recruiting Solutions. If you’re applying for a job that’s far from your location, you should anticipate needing to move. Keep the attention of the hiring manager by including your willingness to move very quickly in your cover letter and resume. The job opening you applied for isn’t really available to the outside public. A company might put up a job posting purely as an exercise in curiosity, but actually be aiming to promote internally. Make a strong argument for yourself as directly as possible to the hiring manager, and continue to inquire about the job posting as long as you see it’s still up. You never know if circumstances within the company might change — they may decide not to hire internally after all, or decide to hire two new people because they’re expanding rapidly. Aim to keep your name in the game. Nathaniel Patterson, a former staffing and hiring manager, gives this valuable piece of insight: “Some companies have policies that any job opening has to be posted publicly,” even if the company already has already chosen a candidate. Nathaniel describes this policy as an attempt to “be more fair and equal.” Unfortunately, it is also a serious inconvenience to anyone who spends time on his/her job application! This policy is a serious inconvenience to anyone who spends time on his/her job application! What prompted the position to be open? What is their ideal candidate profile? Do they already have someone in mind for the role? Patterson explains that these questions will impress a hiring manager because any self-respecting job candidate should know the answers to these questions, and will help you understand the “soft” requirements the job role requires. Not having a job can negatively impact your job search, ironically enough. Patterson also explains that some companies won’t hire candidates that aren’t currently employed. Your education, qualifications, and resume may be perfect, but you may be excluded simply because you don’t currently have a job.This is because recruiters and hiring managers are looking for people who can acclimate to the new job quickly and have a shorter learning curve. According to conventional wisdom, candidates who are currently employed tend to fall in this category. Patterson says that job seekers should “find work while they are looking for that better job.” Admittedly, sometimes finding a basic job can be difficult. He suggests looking into working for a temporary staffing agency, and updating your resume frequently with the names of the companies you’re tasked to work for. If you applied for the job through a staffing firm, the company may intentionally be ignoring it, according to Patterson. Staffing firms charge a large fee per job role filled, and the company may think it’s capable of filling the position on its own without spending that cash. Try to apply for job openings through the company directly to avoid this issue. If you can make someone else work to help get you a job, that’s a big bonus. In other words, you may have written a perfect resume for a position that’s evolved into something different than what you initially applied for, making your resume less relevant. You may find that the job changes so much that your skills are no longer relevant. You can overcome this issue by keeping your eye on the job posting and noticing changes. Keeping a line open with the hiring manager will also help clue you in to the evolving nature of the job. You may find that the job changes so much that your skills are no longer relevant. On the other hand, you may need to update the hiring manager and let them know that despite the changes, you still have the relevant qualifications (which you may need to mention in a new cover letter or resume). The job you applied for is on hold indefinitely. Executive coach Elva Baxter explains that some companies may create job advertisements, and then put the positions on hold because circumstances have changed, or the position is eliminated altogether due to restructuring. Circumstances can change rapidly in a company, so it’s best to keep observing the position or staying in contact with the hiring manager. You won’t be able to force your way through this barrier, however. You applied to a job that doesn’t exist yet. Marilyn Santiesteban, assistant director of the career services center at Texas A&M University explains that some job postings are advertising for roles that don’t yet exist in the company. The hiring manager is simply planning ahead and collecting resumes from people in case the job does open. It’s hard to know if the job you applied for doesn’t actually exist. The best you can do is try to contact the hiring manger and make sure they remember your name for if — or when — the job role is created. Job searching & procrastination: A deadly combo. You applied “too late.” Technically, you applied before the cutoff date, but the hiring manager has already started making a decision. Stephanie McDonald explains that hiring manager often quickly receive several excellent resumes, and decided to cut off the selection process earlier than anticipated. If you notice that the job advertisement’s cutoff date is still far away, don’t procrastinate. You may find yourself wondering if you had a chance if you’d simply applied earlier. Applying too early can also mean your resume falls under a stack. Still, it’s better to apply early and follow up, than to apply late and have no chance at all. Your excellent qualifications make it seem like you’re going to ask for too much money. Ms. Baxter makes an excellent point that candidates coming from well known, blue chip companies may experience a problem where their resumes are ignored because hiring managers assume they’ll be too expensive. If you’re coming from a big, well-known company, Baxter suggests framing your cover letter in a way that suggests you’re “seeking smaller company opportunities” and are very flexible with the arrangements. Although you’ve tried your best, you may still be shooting in the dark with your job application. In other words, although you’ve tried your best, you may still be shooting in the dark with your job application. The sooner you can touch base with the hiring manager, the quicker you can come to understand that the job is not what you expected, and move on to more realistic job opportunities. Try to keep your social media profiles clean. Your job application looks great, but the content that shows up on your social media is inappropriate, offensive, or unprofessional. It’s irritating but you can’t expect anything to be truly private anymore. You might consider doing an edit of your social media profiles (all of them!) to make sure you’re not giving off a bad impression. You may have noticed that the majority of these problems have the same solution — getting in touch with the hiring manager. Unsurprisingly, almost all of the hiring managers and staffing experts I contacted emphasized the importance of networking, because it’s the only way you’re going to mitigate problems like these which are otherwise completely out of your control. You may feel like a pest or annoyance, but actually you’ll be making a good impression. Establishing direct contact will demonstrate that you’re serious about the opportunity, and have drive beyond the average job applicant. 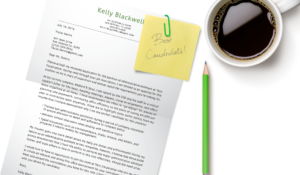 Be proactive, and don’t let your perfect resume go ignored. This is an excellent summary of the many factors that play into a hiring manager’s decision process. However, I’m not sure #8 is as prevalent as suggested. Typically, at the point that a company engages a staffing agency, it is because they’ve had no luck finding the right candidate on their own and welcome any resumes we can send their way. Otherwise great list! Thanks for the comment Michelle, staffing firms definitely have their place in the job search ecosystem and the language may have been a bit strong in that point.